For a long time now it’s been evident that soon technology will rule the world (if it doesn’t already). It seems as though every day surprising amounts of new electronic gadgets are introduced, and the good old pen and paper get forgotten in the attic to collect cobwebs and mold. This article will address why you should turn off your laptop, put away your tablet, and go back to the basics during your design process, as well as provide some of the best tips to getting started with effective sketching. When you first start a project, there’s a tendency to automatically start coming up with different ideas. These ideas may seem great at first, but the truth is, there’s a big chance that your first ideas are pretty obvious. For example, if you were creating a logo for an orange juice company, the first, obvious solution most people would think of would be an orange. While the logo will probably end up having something to do with an orange, what can you do to present this orange in a new and unusual way? Use sketching to find out. Sketching lets you get all the obvious ideas out of the way, so you can start coming up with stronger, more innovative concepts. Plus, you never know what will inspire you – it could be one of those obvious sketches that spark a million dollar idea! These days you can take a laptop almost anywhere, but taking a sketchbook and a pen is even more convenient. With a sketchbook you might end up finding yourself in more rural areas like rivers and parks, as well as museums and subways, and who knows where else! Another benefit is that you will be exposing yourself to different environments, which will inspire your designs and bring you new ideas. There’s something about holding a pencil in your hand that gets your creative juices flowing in a much different way than holding a mouse. When you get used to sketching, the movements of your hand become much more fluid and it becomes really easy and natural. You may also start seeing some ‘artistic’ influences in your design work. The more you practice, the better you will become at sketching. As a designer, it pays off to have a varied skill-set. Developing a strong ability to sketch will allow you to present ideas quickly and easily on paper – for yourself, your art director, or for your clients. One of the most important benefits of sketching is that it gets you in touch with your design work on a whole new level. By spending so much time developing a solid concept, you have a stronger understanding of the elements that go into your design, and you’re able to explain it more eloquently to clients and defend it more successfully if disagreements arise. These can come in very handy when you’re starting a new project, or completely stuck with one you’ve been working on for a while. With both minds maps and word lists you basically list every possible word that’s related to the subject of your project. When I use these for my projects, I first come up with all the words I can think of, then circle the best ones and create little sketches for them to get things going. I’ve heard there are several online applications for these brainstorming methods, but nothing beats doing it on paper, where there’s full freedom to go with the flow of your associations, and add sketches too. Plus, if you’re hesitant about actual sketching, this is a great way to ease into it. Often, especially when you haven’t sketched in a while, facing a blank page can be a bit intimidating. Sometimes it’s hard to know where to start and what you’re supposed to sketch. Start with a dot, a line, a circle, a square. It doesn’t matter. Just let your mind wander and your hand wander with it. Fill a whole page with doodles if you have to. It’s much less intimidating to face a page that has some character than a blank one. As long as you’re sketching something, you’re on the right track to coming up with your next great idea! Keep this in mind: your sketches don’t have to be the next Mona Lisa. Sometimes when I sketch, I find myself wanting to make things “perfect”. Don’t fall into this trap…every ‘mistake’ you make is really an opportunity to get better and learn. Welcome these ‘mistakes’ – take them on as challenges and you’ll grow as a designer. In fact, experiment with making some of your sketches as ugly as possible – make them practically hideous! If you plan on drawing a circle, draw a jagged, oddly shaped ellipse. This will help you loosen up and express the ideas that come to you freely, without getting caught up in how well you can draw. If all else fails, remember this: no one has to see your sketches – you can keep them as private as you’d like – so don’t be shy! A while back I was working on some cover designs for a product for firefighters. I had a pretty massive creative block at the time – the kind that sinks its teeth into your brain and gets you irritated at every moving (and non-moving) thing around you. For the life of me I could not come up with the ‘perfect’ idea… I couldn’t sketch… Nothing. Now there was a question I could answer easy as pie. I could have a giant fire truck with two muscular firemen in suspenders (who are obviously not firemen) holding their axes, with giant flames in the background…oh, and don’t forget the water hose. I sketched this, got a good laugh, and before I knew it my creative block dissolved like two Alka-Seltzer in water. Here’s my point: when you come up with the worst possible solutions for a design, and give them life by sketching them, it frees your mind from their weight, and leaves it open to new, innovative, and brilliant ideas. Unfortunately (well, maybe it’s not unfortunate), it doesn’t always end up like that. The sketchbook I designated for my own branding ended up serving as all of the above. Which brings me to my next point: sketch anywhere and everywhere. Ideas have the tendency of visiting us at unpredictable times, and in unpredictable places. It’s often hard to keep track of which idea is supposed to go in which notebook, and which one you’re supposed to be carrying around. My solution to that is to use whatever’s available – even napkins. Including sketching as a significant chunk of your design process requires a bit of falling in love with it. It makes the process much more enjoyable and lets you to really dive into it without dreading it. To start falling in love with it try sketching in your free time, too. 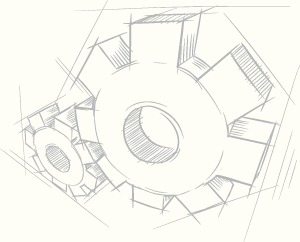 Sketch things for fun – things that interest you – big things, little things, tall things, short things, trees, buildings, clocks, pens, robots, fluffy animals… whatever floats your boat. Personally, I really, really like sketching fruits and vegetables… interestingly enough it makes me quite happy. Find what works best for you. Try using different tools like pens, pencils, watercolors, charcoal, and chalk – to name a few – as well as different surfaces. Use ones with which you feel you can express yourself in the best possible way and you enjoy most. The more fun you make this for yourself, the easier it will be to stick to it. How important is sketching in your design process? Do you mainly rely on technology or paper to develop your ideas? Plus, do you have any other tips to share that worked well for you? Lou (Louisa) Levit is the co-founder of creative agency Unexpected Ways, as well as the co-founder of Reliable PSD: a web development partner for freelancers, agencies, and companies in HTML and Wordpress coding. She lives in Portland, Oregon with her lovely husband and biz partner, David Tendrich. More about Lou’s business: Reliable PSD is what happened when a group of designers got fed up with the available web development and design to code solutions out there…and created their own. Check them out, and see why Hundreds of agencies & freelancers love having Reliable as their partner for HTML & Wordpress coding. Very interesting article. You’re very right about these things. I’m also having talent at drawing, but I can’t get the feeling I get by working directly with Illustrator. Anyway, nice article! @Cosmin Negoita, Hey, I’m glad you found this article to be useful. What feeling do you get working directly with illustrator? I mean when sketching, I cannot get the same quality as in Illustrator. In my point of view, if the more quality my logo has, the more interesting it seems to me. I don’t know if you understand me, but this is the way I think. Of course whens sketching you have all the power in your hands! @Cosmin Negoita, I understand what you mean. You can still use sketching to develop your ideas and then take those sketches to illustrator and get the quality you like there. I’ve found that sketching really helps in developing strong concepts before you make them digital. @Atlanta Graphic Designer, I appreciate your advice. To be honest, I’ll try your way 🙂 It sounds effective! @Cosmin Negoita, I understand you, I feel the same but.. I mix them, by using a wacom tablet. Have you tried ? Lovely article, thanks! What’s great about sketching for me is that my artistic skill is much better on paper than on the screen, despite having a Wacom. It’s much easier to draw something and scan it in, and then possibly trace it. If nothing else, it gives it more character. On a similar note, I would like to use this space to vent my frustration that my first Moleskine has not arrived despite me ordering it a few weeks ago. @Conor O’Driscoll, Scanning works better for me too. I think I tried using a Wacom to sketch one time, and then decided I would never do it again. There’s just something much more raw and honest in my designs when I sketch, so I don’t ever compromise it. Nice article, I was actually working on this topic for my own blog and had some similar points. I already talked about the idea of using a notebook for ideas and writing, so I wanted to talk about this as a follow up. One of the ideas I wanted to explore is that when working with pen and paper, you aren’t limited to what the computer can produce. Sometimes the vision in our head can’t be properly created with a mouse and the Pen Tool. Even using a tablet isn’t exactly as precise (although they get better every day) as pen and ink. @Joe Gillespie, Hey Joe, this is also relevant when creating more complex graphics. For example, if someone is creating a design that involves photography, they may limit their design based on stock photos that are available to them, as opposed to developing an idea first, and if a photo is not available anywhere, creating it in some way. I think designing this way creates more of a challenge, but it makes you grow as a designer quite significantly. Yes, I sometimes find myself in the same situation. You have a great concept worked up, but you can’t find the proper stock photo. Luckily at Fox Chase, we have an in-house photographer and we can usually get the right shots ourselves if the stock house comes up empty. Also, having a sketch in hand can help get your point across if you are out on a photo shoot. @Joe Gillespie, that’s really awesome. It also really pays off to have really sharpened Photoshop skills in that case – because a lot of times you can create images that you can’t find anywhere from a combination of other images if you know how. I think in that way sketching gives you the opportunity to develop more than one skill…but really a pretty large variety of them. Some great application there, David. I took a second to read through your blog and you have some great things there. As a fellow copywriter, I will be sure to visit your site frequently. Here’s a question: How do you know when you have finally reached that moment when you should “write home about it”? I mean when do you know it’s time to stop? that you’ve reached the perfect option? I’m very big on pencil and paper. Take my notepad everywhere, write down everything and then walk away when the idea tank is absolutely spent. After catching up on other projects, emails and whatnot, I go back to my headlines and can easily weed out the junk and focus on what feels right. Definitely a gut reaction, a visceral thing. If nothing grabs me, I start all over again. My first CD insisted that I write 100+ headlines before he’d even look at what I’d written. These days, I don’t get all the way to 100, but damn close. My best stuff definitely comes when I’ve spit out the puns, cliches and start getting a little delirious. @Desiree J, Hey Desiree, sometimes there’s just nothing that beats that feeling of mental exhaustion after you’ve vomited it all out on a piece of paper. It can be exhausting, but it’s also really exhilarating at the same time…and you know there will come a point when you write or sketch when you just have to say: “ok, that’s it, there are no more ideas left in me.” And after that happens, all the great ideas come :). Some great insights here, Desiree. I recently had a good laugh when I revisited some brainstorming I had done for good blog post titles around a year ago. Time is certainly the best medicine for bad ideas. When it shows up under my pencil – I always get this sinking feeling in my stomach, like the stars are aligned and angels are cheering me on. I know, it’s weird, and I literally want to “write home about it”! I feel this need to share it and show it off. Like the world has to see it. Usually Lou is sitting right beside me, so I make her stop whatever she’s doing and listen to it. The gleam in her eyes confirms to me that it’s the right headline. So I guess it boils down to a gut feeling. Not a very tangible answer, but it’s the best I can come up with. How about you? How do you know? Would love to hear your thoughts. An interesting answer, David. I’m not sure how I know when I’ve got the perfect idea. I guess when it just clicks with the purpose of the design. When it matches the criteria better than any other solution, and will get the job done more effectively than anything else, I think that’s when I know it’s time to stop searching for the right answer because I have already found it. I hope that made sense. Thanks for sharing your thoughts! @Preston D Lee, My biggest problem with knowing when to stop (I’m speaking more about design now) was when I was working on our logo/branding and it went through about three incarnations…it took 8 months, believe it or not…it was pretty ridiculous. But I just couldn’t stop. Somehow when you’re designing for yourself everything becomes ten times harder, especially determining where that elusive finish line is. I know what you mean. I have often contemplated hiring a designer I really respect to just do my personal branding for me. It seems like every time I do it, I end up hating it a month later. Ah, the irony of being a designer. Hey!! Very useful and interesting article! Sorry GUS, we reserve the right to edit any comments we find inappropriate. A kind reminder that comments which add to the conversation are most beneficial for all of us. This is funny. I had actually started doing this a few weeks ago to try and get my creative juices flowing a bit more. I was starting to feel like a pixel pusher and technical person rather than someone who is creative. Now that I stumble across your article it is good to see I was on the right track. I feel like sketching is just easier than tinkering in photoshop or illustrator. You can have an idea and just put pencil to paper, rather than getting out the pen tool and messing with vectors. This blog is now on my RSS feed. Thanks! Glad to hear you’ll be reading from Millo regularly, Elliot. I hope to see you back soon in the comments section. I would also add to what you said: to avoid “pixel pushing” too much you should probably stay away from the computer as much as possible during the initial brainstorming phase. I know that when I think I have a great idea with one or two sketches, and I rush to the computer, I never return to the sketchpad. A big NO NO. How long do you usually sketch before you take it to the computer screen? I really don’t sketch for very long. Not nearly as long as I should. Main reason for this is that I work in an agency so time constraints can be pretty tight due to pressure from bosses and multiple projects running at the same time. I will definitely remember to sketch for longer next time though :). @Elliot, I think the important thing is not necessarily to sketch for huge amounts of time, but to make sure your sketching time is used effectively, you know? @Preston D Lee, Preston! What a great, great point you make here about the amount of time spent sketching! It really is about where your focus is when you sketch, and not about how long you do it for. Sometimes, if I’ve had an idea swimming around in my head for long enough, after I do research, when I sit down to sketch I can get a great idea at the very beginning (pretty awesome when that happens). But yeah, when you feel you’ve done the leg work, and then you feel like you got a solid solution, it doesn’t matter how long it takes. @Elliot, Hey Elliot, I’m so happy for you you’re getting back into sketching! Something about sketching is just so liberating, and gives you so much freedom to be more creative. This is especially true after you’ve been on a computer for days/weeks/months on end. When I end up spending too much time on the computer, I love taking my sketchbook outside to nature. Fresh air, greenery, pencil and paper…and the ideas just don’t stop coming. Plus, it’s just really enjoyable and relaxing. Great article – I’m a massive fan of sketching as part of the design process. The one extra(ish) benefit I’d add is that it’s simply much faster. I tend to think of ideas and variations much faster than I can translate them into pixels, and being able to sketch them out really helps my creative process. And totally agree with @Joe Gillespie’s comment about computers potentially limiting what we can produce. It’s also worth mentioning the media we can use to sketch with: not only pencil + paper, but on whiteboards and glass for team-based ideas generation and refinement. Some nice additions here, Ben. Thanks. I LOVE sketching on a white board because it’s so easy to alter and I just love the feel of it. Weird I know. Anyway, the whole idea of it being faster is spot on! Our brains move faster than our hands do in the first place, but make me use the pen tool, and my brain is going at supersonic speeds in comparison. So what is it about whiteboards that you (an your colleagues) like so much? @Preston D Lee, not weird at all! 😉 I/we find that clients get really enthused when they can see things taking shape before them, when we sketch on whiteboards, and it’s much larger than on paper. Also, doing it on a whiteboard kinda forces me to be a bit more free and less fussy with what I’m drawing. Also, whatever we draw on the whiteboard we use for brainstorming and client sessions can be printed out, or sent via network for emailing, etc. sweet. I did a blog post over at Catch Media (http://www.catchmedia.com.au/cm/?p=202) about the benefits of wireframe sketches too, touching on this point. Thanks for sharing that post. Also thanks for your insights on how sketching for a client can help them get excited about a project and help it really take shape. Honestly, I would really like to explore this idea further with you. Would you be interested in writing a guest article for Millo on the topic of helping clients see a project take shape? Obviously more beautifully phrased, but that general idea. @Ben Crothers, Hey Ben, awesome points. Sketching really is much faster…trying to formulate one idea on the computer may hinder 10 more ideas that are right on the tip of your tongue – but you may simply never get to them since they get forgotten in the process of trying to create that first idea digitally. Like Preston, I’m with you on the whiteboards…I’d love to try glass too…that would be fun. Even though I love writing/random sketching on them, I haven’t actually tried whiteboards as part of my sketching process – but I’m intrigued! I’ll have to give it a go next time. Nice article! The funny thing about sketching is that at first it doesn’t sound ‘effective’ or ‘professional’. But once you try it you find out it’s the opposite. After some time, your works seems to get better! That’s a great point, Julio. Why do you think that is? What is it about sketching that makes your designs turn out better in the end? Any thoughts? @Júlio Bueno, That’s really interesting. For me I’ve always had the opposite impression since I’ve never ‘known’ design without sketching…so I always thought that design that did have an extensive sketching process was more effective and professional. But it’s pretty amazing what a difference sketching can make in your work! I would encourage every designer out there to include it in their process. awesome post! it’s been a while since I sketched…I’m getting a sketchpad and start doing it again! @monica a., Hey Monica, I’m so happy you were inspired to start sketching again! I’d love to know how it goes once you get started! Drawing is the life blood for all visual communication. The act of mark-makng in response to our environment and emotions is core. Everyone should do it and everyone can. It really irks me when people say ‘i can’t draw’… when really what they mean is that they can’t draw to a pre-conceived standard. I say ‘make your mark’ it’s all valid. Even the most basic doodle can be a stepping off point for your imagination. It doesnt matter if you’re not a Da Vinci, being you is enough. Extremely well-put Max! Many designers go right to the computer because they feel like they can’t draw. But like Lou said, no one but you even HAS to see your sketches. So just do it! Thanks for sharing! Any other tips you would offer to designers who are timid about their sketching/drawing abilities? @Max Holloway, Hey Max, great comment, and that’s such an important point. Just because society puts a certain value on something, it doesn’t mean that that’s what it actually is. There’s no wrong or right someone can do in sketching, and every one has the right to make their mark proudly! This made me think…wouldn’t it be great to have a community of graphic designers/artists who share their sketching process with each other and only comment on each other’s sketched concepts, as opposed to digital work? I think that would reiterate the importance of sketching in the design community and get those who aren’t doing it so much on board. Hey Lou, that’s a great article! I’ve enjoyed it very much. IMHO it’s a must to sketch before getting to illustrator/photoshop. It helps me to externalize my ideas, starting from the obvious one, until reaching the best one! Mindmapping also helps me to discover great association and path to follow in the design (when talking about the design of a logo). Also sketching UI for websites it’s free of the limit to get all pixel-perfect aligned and so on. I’m not a artist not even a vectors’ guru but when I’ve the opportunity to sketch I can try different solutions (in different quality) before to lost a lot of time trying to reproduce every ideas in digital. I’ve never tryed sketching with a tablet, I’ll sure give it a try but I feel like it won’t be neither a distant substitute to pencil and paper. I probably sketch on every piece of paper I get under my pencil or pen. I naturally have some “official” sketchpad but, what I would like to say to junior designers, is to don’t wait to put down the ideas when they’re flowing in your mind! Many times I have ideas and solutions even while driving my car going in office. Looking at the roads, billboards and nature around me while in the traffic, with the mind free of the stress of being in front of a computer o with the office telephone ringing and ringing, gets my mind relaxed and my ideas flowing. So when I discover some new way to accomplish to my tasks I use to send myself an SMS (yes, I know, it looks weird) in order to fix it on a piece of paper as soon as I have the opportunity. I’m full of small pieces of paper, post-it and similars with some annotation, sketches and to-do lists. That’s gives me the flexibility to think on all of them in different situation and humors and eventually to discard them and totally eliminate them. @Unique Design, Hi! Thank you for sharing your experience, and I’m glad you enjoyed the article. It’s so true that you can get an idea in the most unlikely circumstances…it’s a bit challenging if you get one while you’re driving, but maybe keep some form of paper and pen in your car? I should start doing that – I’ve drawn on far too many paper coffee cups. Having the design process occur in such an organic way, with little pieces of paper, and post-its, and lists, and sketches from random places just makes it so much more exciting, doesn’t it? People look at you and you’re almost like a ‘mad’ inventor whose wheels are always spinning. @Atlanta Graphic Designer, I love your “People look at you and you’re almost like a ‘mad’ inventor whose wheels are always spinning.” I think it’s exactly how I feel when I have some great ideas and run to fix it on a piece of paper! I will surely start bring with me a pen or pencil and a small sketchpad. To me, drawing directly on the computer is often very tempting – not only because the final work requires digitalization, but also because using graphic softwares, with their countless artistic possibilities, is quite challanging, and therefore a lot of fun, too. However, I totally agree with you on this one. There’s no doubt that sketching is the more natural way to depict your creative vision. It is much easier to just doodle by hand, and it’s a very good way to just express yourself freely. @Ido, This is a really interesting point. I guess it IS pretty tempting with the endless possibilities that technology gives you…these days, with a click of a button, we can do things that took weeks years ago. That gives us so many options. How do you think you can make the sketching process as exciting as technological innovation? I see sketching and computer based design as two very different processes, each requiring unique skills, knowledge and experience, and both exciting in their own special way. With that said, I wouldn’t recommend relying on just one of them in a design work. Like everything in life, you must find the right balance between the two, and always keep in mind the pros and cons of each of these techniques. @Ido, Hey Ido, that’s interesting – for me, while they’re two different processes, they’re completely bound to each other. You can’t really have one without the other. Also, in my experience, sometimes sketching takes much more time than actually executing your ideas digitally. Of course that also depends on your experience and skill with different software. @Ido, you are dead on on this.. A designer who can’t sketch, usually isn’t GREAT at design but might be able to design WELL. Vice versa, a GREAT ARTIST or SKETCHER or whatever can probably pick up design much easier because it’s all about working out a way to the best solution to a problem. @Atlanta Graphic Designer, I believe that’s generally true, and your’e right – it depends mainly on the designer’s skills and capabilities. Anyhow, I find the subject you chose to write about very refreshing, and your writing especially inspiring. I can’t wait to read more posts like this one. Very interesting article and I agree with all your points. It’s also worth noting (for people who may not have picked up on this in the article) that sketching applies to areas of development you may not initially expect (I believe David touched on this in one of his comments when he said he writes down headlines). For example I’m sitting here right now sketching out at new database schema to help me visualize how different tables and columns are related to each other. I’ve been able to successfully eliminate some unnecessary complications that will hopefully allow for some faster queries to the database which would result in an overall speed improvement for anything that interacts with the database. This also makes something that would seem fairly intimidating on the computer pretty easy to comprehend on paper. We can take another example and see similar results: programming. Sketching out a workflow for programs on paper forces you to break down a complicated task into smaller sections that make it easier to comprehend. All of a sudden what might have been very intimidating in your head doesn’t seem that bad. At this point you’ve already got an idea of where to start, trouble areas that might need extra attention, and a sense of overall organization to keep everything clean for when you actually start coding. Well these are just my experiences from someone who doesn’t really have much luck from the graphic design side of things. To reiterate your point, people should sketch everything (literally) even if it doesn’t make sense to; there are many benefits to doing so. There’s also just something about the having the freedom to put something down on paper in anyway you want coupled together with the physical constraints of the paper and pencil itself. It forces you to think of things in smaller chunks instead of the overall larger concept which can make it easier to approach when you’re ready to tackle it. Who knows, it might even make you more likely to get to work if you see it’s not as bad you made it out to be. Apologies in advanced if I’m not clear/being vague. @Tom Elm, Thanks for tying this into other areas – it’s always interesting to see how different elements of one process apply to other processes. I’ve found that it’s actually pretty amazing what you can learn about the kind of work you do by exploring other people’s work, or other processes, even things that occur in nature. There’s so much to learn from everything around us. Real nice and inspiring read, keep up the sketching process, it’s an ever evolving skill and tends to do great things for alot of reasons. Express yourselves! Lou thank you for this eyeopener. I used to sketch all the time back in college, but have neglected the skill for years working as a freelance web designer. I usually go straight to my digital tools, even for mockups and wireframes, but after reading your article I will surely give sketching another chance! @Danijel Gajan, I’m so glad the article inspired you to pick up sketching again! I hope you have fun with it! We sketch all the time. A lot of our latest designs are based on early sketches. I think it takes you out of the digital constraints and gets you back to that raw visceral creative spark. I Absolutely agree. This simple approach is often overlooked and the result is that people tend to follow trends rather than explore their own path and create something unique. @phil wright, Great point! Sketching really lets you get all the ‘trends’ and obvious ideas out of the way so your mind becomes more of a blank slate and you’re able to have a different approach to the subject. You are probably right, but I’m one of those oddball designers that is really creative, but can’t draw well, so the idea of sketching is really intimidating. However, I agree that I probably don’t consider as many ideas as I would if I was quickly sketching them rather than trying to flesh them all out on the computer. @Jason Graham, Hey Jason, I think you’re not as much of an oddball as you think. I think a lot of designers face that intimidation… even those who know how to draw. I hope you found some useful tips in the article to help you overcome that initial fear and dive into it! I think it’s great to talk about these fears and bring them to the surface… that way we all can grow together and help each other! Great article. Congratulations. Even though I sketch a little every day, your article reminded me how important it was. For me, it’s almost like a “secret weapon” in my arsenal of design tools that I can keep in my back pocket and break out when I need that extra advantage or method of breaking through to a great design. Thanks for the article. @Ed Lain, Hey Ed! I’m so glad you found your way to this article… I’ve been meaning to send it to you but you beat me to it :-). I’m glad you enjoyed it. it with them. Thanks for sharing your sketching wisdom! @Deb Wood, Hey Deb! I’m honored! Thanks. I’m agree with point number 2. Sometimes, we forget some ideas we have. Very Nice Article, however i would like to share few things. I had the passion for drawings during my school days. and it is very long since i sketched anything. do you think i should stick to programming or is there a possibility of me sketching things. i really don’t know if i have the right talent for it. i am a great admirer of graphics though. @Ibrahim Azhar Armar, Hi Ibrahim. Thank you for sharing your story. I think you should do whatever you’re most passionate about…whatever deep down in your heart your really want to do (as cheesy as that may sound). You may want to do both, or you may want to do just one of them. You don’t have to choose one just yet…or ever. You can explore your passion for graphic design while still working as a programmer. I have gotten out of the habit sketching out my ideas but I do notice that when I do the overall design usually ends up better. I really thing that the mind interprets hand to paper differentially then just computer entry design. @Allen Cooper, Hey Allen, I like the way you phrased it. I bet that there’s an actual scientific impact on the brain when we use paper and when we use computer. It would be cool if someone did a study on that. Nice article, keep spirit for the good sketching. @utari, I’m glad you got something out of the article! Thanks for leaving a comment. love this article! Just recently started adding the sketching process back into my design process (I had gone too far towards digital…) and it has opened up a whole world I had forgotten about. Its interesting that once I started sketching again (and carrying a sketch book) I noticed that I started looking at things differently again. Its like it opened my eyes to the creative process again. Kind of like how a photographer is always looking for that interesting shot. @Jon Pianki, Jon, thanks for your comment – I’m glad you enjoyed the article. I think it’s so true that you look at things differently when you sketch a lot – it opens you up to ‘unrealistic’ possibilities as well, and your imagination can really go wild without any restrictions. What differences have you noticed in your completed designs since you’ve started sketching again? @Lou Levit, For one, I think my overall concepts seem more thought out especially with logos. “Digital Sketching” seems to make me have to refine more to really evaluate an idea/concept, where as with a hand drawn sketch I don’t have to modify type or combine and create shapes. I can just draw it how I want to see it and in less than five minutes I have a good idea whether the layout has potential. This also helps when presenting the idea to the client. The idea is more thought out and therefore easier to present and defend. I think this has also made my overall final product more refined and the execution better. Another thing is the time it takes to really get something finished seems to have been cut down. By sketching my ideas first I get through all the bad ideas quickly and can then focus only on the “good” ideas when I move to digital. Lastly, and here is a big one, sketching allows me to really be inspired by anything and go anywhere with an idea. Its what I like to call “fairy dust designing.” The kind of designing when you say, “ok…if there were no limitations to this and ANYTHING were possible, what would I want it to be?” Then I work backwards towards reality. @Jon Pianki, I really like your “fairy dust designing” approach! I think that’s a great question to ask yourself to really get some super creative and exciting ideas flowing. You also make a great point that projects get finished more quickly…on the surface it may seem like sketching increases design time, but really it focuses your efforts, reduces time, and provides you with a better end result. Just a question…did my comment from earlier get deleted? If so, did I post something wrong? Just wondering. @Jon Pianki, Hey John, I think the comments just take time to get approved…hence the delay. @Lou Levit, Good to know. It was weird because I posted one day and it was there, then I came back a day later and it was gone. I then came back later again (thinking it was just the approval delay) and it was back…but then I refreshed the page and it was gone again. That was the only reason I asked. It just seemed like it was being taken down. Sorry for the delay. Your comments are appreciated here at Millo! We just try to weed out the spam before publishing comments so that you guys don’t have to deal with garbage on the site. Thanks again! @Preston D Lee, …and we appreciate it! Last week on the blog, I had this topic posted through an interview! @Misty Marcum, Hey Misty, thanks for the support! I’m glad you found the article useful! Awsome advice! I carry an A5 sketchbook and some pencils with me everywhere I go and I try to fill one every few weeks. I find the lengthy process of rendering in pencil helps you become intimate with your subject or idea, even with layouts and typography. When I meet with clients to discuss a job, I often sketch out the ideas as we talk and so come away with a clearer vision of the brief. It also makes for great content on facebook, blogs and websites. A5 is a good size sketchbook – I never did do well with “normal size” paper, and I think a smaller sketchbook is less intimidating anyway, especially for those who have some anxiety about sketching – a smaller page is a lot less scary to fill! Totally agree – sketching makes good content anywhere – it’s just plain cool aside from all the other benefits! This article is a very good eye opener. As a moderate level graphic designer, I’m learning new things everyday that I could apply to my art; sketching is something that has helped me tremendously! It has even provided me with new innovations to apply on the computer aspect of design and implement into future works I may come across. A good technique I use is to develop several “thumbnail” images on a sheet of paper. Then I pick a few designs I like best. Variation diminishes designer’s block. That’s related to this article as well. I believe once you start sketching, it seems ideas flow more fluently and easily- from your brain to material. Overall, you feel more complete as a designer and you feel more organized. You are very welcome Clark Ross! I’m glad you enjoyed this article, and that it has become so popular, as I think sketching really is such an incredibly important part of the design process. It’s not to fear, but to be embraced! Good article. I personally like to use graph paper when sketching logo designs, as the grid lines help keep things even and work as a useful guide. Tracing paper and a cheap light table (can be bought at Michaels) are also great tools for honing illustrations and rough logo design concepts. Graph paper is a miracle I’m in love with. As a design professional with 25 yrs experience, I have seen technology evolve in so many wonderful ways when it comes to allowing us to do that which we love. NO DOUBT it has brought ideas to life in ways that we could not imagine. Thank you for your comment! I totally agree. I suppose technology, just like anything, is important to use at the right time and in moderation. Sketching is a vital part of design. You don’t have to be an “artist” or good at it; you don’t have to be the one who can draw, we all can draw. Sketching, chickenscratch, or doodling on napkins, whatever you want to call it, gives you the ability to dive deep into your brain; to explore quickly, the good and the bad. The computer is only a tool, not an idea generator, not your creative brain. Twenty years ago we would still go outside and look at clouds as an exercise to free up our minds and create images and shapes from the positive and negative spaces. It’s a long lost art and many have skipped that essential step. For all the years I’ve been a designer, I could never start an in-depth project without pencil sketches. My clients really appreciate the time I put into them (even though they don’t take that long), and they love being able to see the creative process in such a raw format. There have only been a few projects where I didn’t have time to do pencil sketches, and my final concept wasn’t as polished as it could have been. I always carry a sketch book with me for notes or ideas that pop up for no reason. The best ideas come while I’m doing mundane tasks. I don’t think I could ever give up sketching/drawing as my starting point for projects. “don’t have to be the next Mona Lisa” when i read throug this words, I got the flash of idea what i have to do next for my self. thank ! I used to be an airbrush illustrator for eleven years then made the transition to computers. My first computer illustration took me six hours start to finish and I got paid the same as I would for an 36 hour airbrush illustration. Plus, no messenger service. THAT was the moment that I realized the value of computers. This was all before the internet. But I have never not sketched a concept/idea/thumbnail before execution of a project. Sketching is an essential process in creativity. The computer is a high-tech pencil. The skills you have and develop with real paper and pencil almost always transfers well to the computer. The one thing I find that I do like about computers over a real pencil? Being able to hit the undo key and try a brushstroke, line, color over again. Hi, it is so very true. Though after the computers the sketching or scribbling the thoughts have gone out of fashion and considered a waste of time by many. But I feel going straight to computer restricts your options and possibilities of ideas, which float in your mind at a much faster pace than a computer can ever perceive. Sketching helps you to take a plunge into the sea of thoughts one has accumulated over a period of time and therefore liberates the process of visualisation. Having been an artist for several decades, I’ve learned to sketch in my mind, first. Then, if or when something needs further development or I just don’t want to forget what I’ve sketched in my head, I’ll quickly do it on paper. I’m rather new to using the computer to finalize my ideas. I used to go straight to oil or mixed mediums on canvas, but now I’m using Adobe Illustrator. I actually find it more difficult working with the computer, but I think it’s because I’ve only been at it for a year now. I’m sure, as time goes by and I continue to work with Illustrator, it will become easier. There is something very Montessorian about the process, but it works. The hand/thought connection is strengthens the attention we give to details, wherein as Mies van der Rohe had it, God resides. simply great article. i couldn’t miss a word while reading it. it will be very useful to me. Yes! Sketch! I had fallen away from sketching, and realized that my work was more difficult and felt flat. Once I picked up a pencil again, everything seemed revitalized. Mirado Black Warrior pencils are fabulous. Find your favorite pencil, then test all the paper you can get your hands on. You may find a favorite – I love Strathmore sketch books. Then do what Lou suggests – sketch everywhere, on anything. Draw whatever you see or can think of or can remember. Make beautiful grocery lists! Leave sketched notes for your friends or lovers or coworkers. Your work will benefit immensely. And, you’ll be happier! Cheers! I laughed when I read about your obsession with assigning different books for different ideas because I share the same obsession. I can’t go into a stationery aisle without needing to buy some notebook, pens, pencils or erasers. Ultimately I end up writing and sketching in everything, totally without the order I planned upon purchase. As far as preference, I like sketching on paper more than using my tablet for anything I’m not coloring. It’s more free and light for me to do on paper because on my tablet I have the “perfection complex.” As in, “if it’s not perfect the first time, CTRL+Z!” and re-do. For me, that mindset totally kills the artistic nature of what I’m doing. Also, when I’m sketching on paper I have a road map of sorts from where I began to where I end up, little sketches and notes spanning several pieces of paper, allowing me to see the whole creative process, even much later in the months to come. Having that trail allows me to spawn new creative ideas by combing over what I’ve done in the past, to relive what I was thinking and maybe do something similar but in a totally different way. I work in Illustrator a lot; although I use a tablet for parts of my work, I find I have to put pencil to paper to get the foundation of my drawings (often scanning them to use them as guides). I’ve tried to use a tablet from start to finish, and the work suffers for it. There’s just something about sketching on paper that can’t be duplicated, even with a tablet. Agreed. I’m more free when I do my initial sketches on paper and pen than using Wacom. I feel more in control. I am using tracing paper for easier revisions.